"His enemies would stop at nothing to block Lex St. Johns' nomination for the U.S. Senate - and Pam, who loved him, would stop at nothing to protect him." 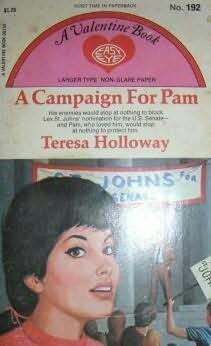 Welcome to a simpler time in American politics, and this week's career romance for young moderns, Teresa Holloway's A Campaign For Pam, from 1970. Handsome young politicians, earnest environmentalists, polyester knit dresses, feisty career gals, intrigue - and, of course, romance - after the jump!The Heroine: Pam Pomeroy, feisty brunette journalism major with an interest in current events. Pam is highly efficient and wears "dark-rimmed, oversized glasses." (Yay!) The Industry: Pam comes onboard the campaign as a sort of girl-Friday, working on speeches, press, image and every other facet of the race. She also becomes the resident expert on environmental concerns The Hero: Red-haired, leontine young state senator Lex St. John, who has an idealistic interest in environmental issues and wants to break the political mold. "For too long there's been this image of the southerner in public office - long hair, string tie, the old colonel, suh, concept - that's existed mostly in the minds of northern urban liberals." Whereas Lex St. John is a reformer! The St. Johns' measure will mark this state as a commonwealth concerned with clean air, pure water, and preservation of our priceless marshlands. This year we can take that first step back toward living in the kind of environment the Creek Indians knew when their heartland stretched along our river valley, when their sacred 'holy-ground', the source of their spiritual and material refreshment, lay richly in the salt marshes and estuaries, the shorelines of our coastal areas. We can go back, we must go back, if we are to go forward together. The Cast: Pam lives with glamorous, blonde Caroline, a possible romantic rival who ends up with another state senator. In addition, there's Phil Zienta, the campaign's patronizing P.R. guy, whose respect Pam has to earn; some millionaire who funds everything; and Pam's down-to-earth widowed mother. The Villain: The Sills Syndicate, a mobbed-up developer who wants to build on the waterfront and put a landfill on the coastline. The Plot: Pam's initially a typist in a steno pool, when a chance encounter with Lex St. John impresses the senator, who's been looking for someone "with a flair for words, a sense of the dramatic, a dash of decision, initiative, integrity - and all this, combined with a knowledge of the Washington scene." They form a team and Pam develops feelings for her boss. "She'd take her chances, doing everything she could to get Lex elected, and try not to inject the personal angle at a time when he needed every thought, every energy, every purpose, to get elected." This includes putting together a homespun grassroots campaign, with a homey campaign headquarters called "the Store" decorated with antique rocking chairs, to emphasize Lex's down-to-earth candidacy. Quickly the principled Lex makes enemies in high places, which eventually leads to his kidnapping in an attempt to keep him away from a crucial vote on an environmental bill. With Pam leading the charge, his team manages to find and rescue Lex, bring down corruption and make sure virtue prevails. In an attempt to throw her off the scent, heavies knock Pam down with a car; she's banged up but undaunted, and all ends with Lex confessing his love, proposing, and, one assumes, a flourishing political partnership. Distinguishing Details: Caroline on smoking: "I'd had this little cough and my doctor ordered me to quit. He asked how many I smoked a week, and I said maybe two packs. That funny man suggested I cut down to six cigarettes." -Pam wears numerous knit frocks, most notably a "shrimp-colored polyester knit" with matching pumps and cardigan.